Home » Moisture Meters » Wood Division Knowledge Base » What Is Specific Gravity in Wood? When working with different wood species, specific gravity (SG) is an important concept to understand but is not always one that is clearly understood. Specific gravity can apply to any substance but for the purposes of this article, specific gravity will be examined with reference to various types of wood. Simply put, specific gravity is a scale that indicates a substance’s density. The numerical scale used to indicate specific gravity uses pure water as the comparison point based on the discovery that one cubic centimeter of water weighs one gram. (1 cm3 = 1 g) A wood’s density is influenced by three main factors: the amount of lignin in its cells, how densely the cells grow together, and the number of air spaces within the cells. Wood that has been harvested is made up of the collection of cells that formed the tree body. Each cell is composed largely of cellulose, hemicellulose, and lignin (there are other trace elements, of course, that vary from species to species). These three major components form the structure of a tree’s cell and their particular arrangement gives the unique properties of various woods. Along with their chemical composition, their physical properties also affect a wood’s density. Tightly packed cells have fewer air spaces and a higher cell count and result in a “harder” (denser) wood. Cells with more water capacity or more vessels for water transfer between them have a looser structure resulting in “softer” wood. Why Does Specific Gravity Matter? Of course, the amount of moisture will influence the weight of wood and, more importantly for the woodworking industry, will influence the dimensions of a piece of finished lumber as the cells expand or contract based on their moisture content, and the way the wood will react with any finishes used. Water occurs in wood both in individual cells – both the cell wall and the contents of each cell – as well as in the various cavities within and between the cells. If you think of each piece of wood as a bundle of very thin straws with a wall and a space running along its length, you’ll realize that even after a tree is cut and harvested, water can continue to move in and out of these cells as long as those cells remain unsealed. Here’s where specific gravity becomes important. Specific gravity for woods is determined by measuring the weight at a specific moisture content level. (The common formula looks like this: Wg = Wd(1 + M/100) and will be fairly consistent within a species.) This numerical value, as mentioned earlier, is actually a comparison to pure water. Each wood species’ ability to float or sink in water is a very rough method of determining its specific gravity. Moisture meters are the tools used to measure moisture content in lumber, but a meter that does not allow for species’ corrections or user-programming of the correct species is not providing accurate information. Consider that the specific gravity for balsa is 0.17 while the specific gravity for mahogany is 1.10. That’s a significant difference! Some meters present specific gravity information through species correction tables – printed charts that let you manually look up and adjust the reading your meter gives. 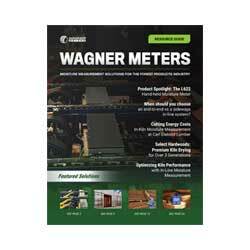 Others, like Wagner’s Orion® line of pinless meters, allow for user programming the specific gravity for a range of softwood and hardwood lumbers, allowing you to select the appropriate species for instant readings. With a basic understanding of the concept and a moisture meter that uses specific gravity settings to provide accurate moisture content readings, the general quality of your capabilities as a woodworking professional will increase specifically. Find the specific gravity for a specific wood type.